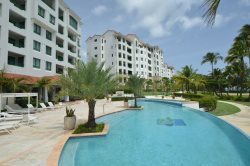 This spectacular 2 story apartment is located at Puerta del Mar, Aguadilla. Come and see this beautiful apartment with ocean-views. It has two Bedrooms, two bathrooms living-room, dining room, and a fully equipped kitchen. This is a very spacious property, with all the things you are looking for in a condo. The condo offers pool area, mini park & other amenities. Near Crash Boat, Restaurants, Las Cascadas Water Park, Shopping, Golf at the Base.